Leave it to the Israelis to take the initiative to develop useful clean-tech technologies while the so-called "smart grid" is just a pretty picture in a textbook. Yes the smart grid is coming -- $11 billion was set aside in the American Recovery and Reinvestment Act of 2009 -- but on an individual level we can take control of energy usage now with the Netanya-based company Computerized Electricity Systems or C.E.S. The company sells a device that monitors exactly how much electricity each appliance in your home consumes and then can program parts of your home to shut down to save energy and money. The idea is to eventually know exactly where the "energy vampires" are in your home and reduce consumption or replace the appliance with an energy efficient "smart appliance." And in California it is easier than ever to rid yourself of that old Maytag refrigerator that is taking a train full of coal and a bank account full of cash to keep running. The California Energy Commission received $35.2 million, the largest of any state, from the federal government as part of the Recovery Act's Cash for Appliances program. So far there have been 21,800 applications for rebates and there is $27,320,000 remaining in the program. 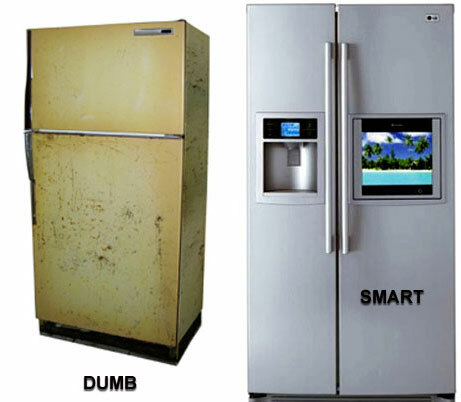 Smart appliances for the smart grid. And consumers will save money and the environment at the same time. Sounds like a win-win.